At Fastly, integrity is at the heart of not only the product, but the company. We founded our company on strong ethical principles, and surround ourselves with like-minded partners and customers. We choose to work with companies and projects aligned with our own business values — that have integrity, that embrace transparency, and that are trustworthy and ethical. Our edge cloud platform offers critical infrastructure that can help support fast, secure, and scalable operations for many diverse organizations – and we offer free services for open source and nonprofit projects like RubyGems, Haskell, Donors Choose, Reporters Without Borders, Direct Relief, and Kiva (to name a few) through our Open Source and Nonprofit Program. Open source projects are the foundation of the internet; by sponsoring their important work, we support our vision for unfettered, scalable technical innovation. We’ve supported numerous open source projects since the inception of Fastly, and our founding team has consistently invested time into open source development. Our CEO Artur Bergman once rewrote the entire Perl threading library, we have numerous open source contributors and maintainers at Fastly. We believe so strongly in the benefits of using open source projects that our early team built Fastly’s edge cloud platform around an open source project called Varnish. Our stack is still dominated by open source languages and projects, including Go, Perl, Ember, Ruby, Vault, h2o, and many more. Our goal is to help serve and grow open source projects: enable creators that want to dabble, fine tune their ecosystem, and even change the landscape of open source — and to help projects that do not monetize their traffic, but are for the good of the community. We also collaborate with companies that support open source development at their core, and that are key to the developer community, like NPM, whose 3.5 billion package downloads per week go through Fastly. We want to enable project maintainers and organizers to focus on their mission, and not on nitty gritty scaling issues. Here’s a look at some of the great open source projects we support — The Python Foundation, RubyGems, HashiCorp, and Tor — and how significantly they’ve grown. The Python Software Foundation joined our Open Source Program to solve challenges serving content for their package manager, PyPI – Fastly proudly became PyPI’s “secret scaling sauce.” It’s been exciting to watch their user base and download requests sustain progressive growth. Interesting fact: Uploaded files to PyPI consume almost 1TB (922GB) of disk space, and of that 477GB of it was uploaded in 2017. In summer 2016 we began sponsoring the Tor Browser Project, serving their browser updates free of cost over the Fastly network. They’ve scaled their infrastructure to keep up with user demand, growing from 50 MB on Linux in 2014 to 85 MB today. In February 2017, update pings (checking whether an update is available) rose to 2,000,000 a day and have stayed constant ever since. Roughly 2.1 TB per day has been transferred via Fastly, with spikes of over 14 TB per day. Similar to open source, nonprofit organizations rely on the help of volunteers to develop their programs, broaden their reach, and ultimately make a difference in the community. There are so many organizations that do impactful work for the greater community — beyond tech — with limited resources. When we started offering services to open source projects, we realized that we could offer the same services to nonprofits. We reached out to programs we admired, offering our support. From there, we asked those organizations to spread the word, and soon found ourselves with an influx of nonprofit organizations that needed our help. These organizations include journalists abroad (Reporters Without Borders), disaster relief organizations (Direct Relief, Doctors Without Borders), and organizations whose mission is to educate (Khan Academy). As we continue to grow as a company — scaling with care in order to best serve our customers — we also look forward to growing our Open Source and Nonprofit Program. We are proud to serve the best parts of the internet, and this extends to open source and nonprofit projects. 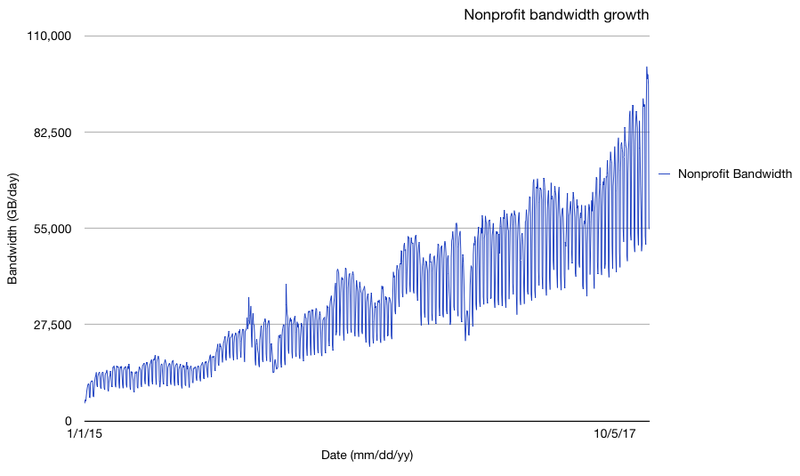 In the past year we’ve more than doubled open source and nonprofit traffic on our network, but our work is certainly not done. We want to enable those who do good in the world, give them a voice, and widen their reach. In 2018, we aspire to help more projects and organizations achieve their mission to make the world (and the internet) a better place. If you have a project that could use our support, don’t hesitate to reach out to us at community@fastly.com.